CyberTECH EIR startups will work independently with the support of the CyberTECH community. In some cases, EIRs may be embedded directly in departments or with Business Units at CyberTECH’s corporate partners to accelerate their business concepts and new technology products and services. In addition to being assigned to a Mentorship Team, CyberTECH EIR startups will have access to no- or low-cost office space, along with discounted or low-cost software, high-speed Internet, strategic, legal and marketing professionals and other early stage startup services. Some startups may be offered stipends or scholarships from CyberTECH ecosystem companies. Please join us for lunch Thursday, Sept. 15 to learn more about this exciting new program. Triton Services is a recognized leader with deep industry, business, and technology experience working for both Defense and commercial companies. Headquartered in Annapolis, MD, Triton Services, Inc. recently expanded operations to San Diego establishing their West Coast Offices at CyberTECH as they continue to develop their leadership role in the Government’s acceptance of open source Internet of Things (IoT) application platforms. 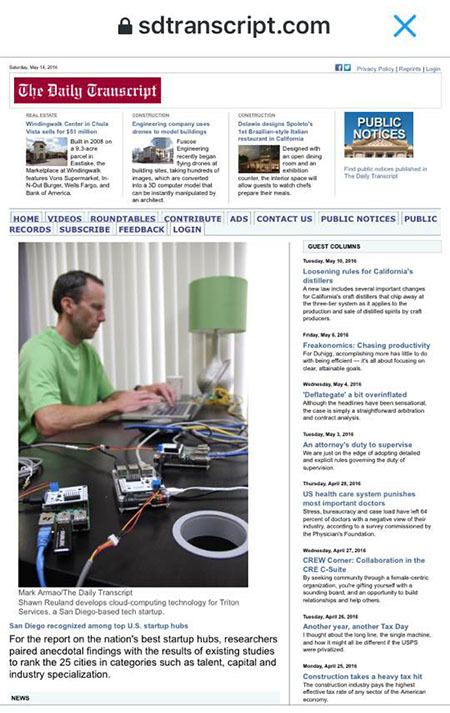 Triton’s Shawn Reuland was recently featured in the San Diego Daily Transcript as he works on the company’s cloud-computing technology. 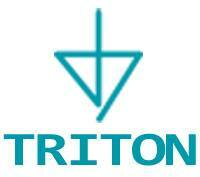 We are excited to welcome Triton to the CyberTECH Community! To learn more visit the Triton website here. Infix your ideas and evolve your business with INFIX.US – Company Life Coaches will look at the operational and strategic aspects of your business and help you evolve to new levels. INFIX will coach your business with a fresh perspective, through guided change, and support your staff with best practices and necessary training. INFIX also offer process improvement, data analytic and staff augmentation services. For the months of May and June, INFIX is offering free initial consultations and affordable help to CyberTECH Members. For more information or to get started, contact [email protected] or call 1-949-4UINFIX. You can also visit the INFIX website at www.infix.us.